Lake Tahoe may hold mysteries. Photo: Santappa. What did Cousteau see? Maybe the bodies of unlucky gamblers who crossed the Mafia in 1950s Reno. Or maybe it was Tahoe Tessie, the Loch Ness likeness of the lake. But, in its coverage of the recent discovery, the LA Times said that Cousteau never actually visited Lake Tahoe. The Cousteau story may be a myth, but it is no less chilling, because the physical conditions of the lake are such that bodies could still be drifting beneath the surface. 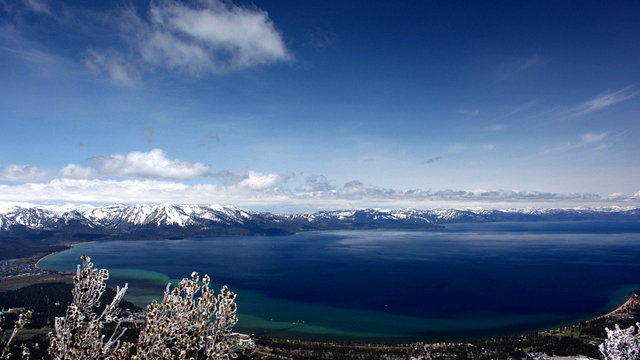 At 1645 feet (depending on the level of water in the basin), Lake Tahoe is the second deepest lake in the US. (Crater Lake in Oregon is the deepest in the country. The world record goes to Russia’s Lake Baikal, which is some 5,369 feet deep.) Lake Tahoe is located between two fault zones, and it formed through a tectonic combo of uplift and subsidence. The Sierra Nevada mountains rose up on the west and the Carson Range rose up on the east. The rock underneath the lake sank down to form a flat-bottomed basin called a graben. The word is German for “grave” and refers to the lake’s low-lying nature—and perhaps also to whatever Cousteau purportedly saw underwater. Lake Tahoe is cold. The temperature at the surface of the lake varies, from a low of about 40 degrees in February or March to a high of about 75 degrees towards the end of the summer. Below the surface, the temperature is a chilly 39 degrees. In the winter, when the surface and the deep waters are relatively close in temperature, the wind blowing across the surface of the lake mixes the water. This brings oxygen from the surface layer down to the depths, and nutrients from the depths up to the surface. In 2010, the mixing occurred from the surface down to about 550 feet, because the surface of the lake remained relatively warm throughout the winter. In previous years, mixing has occurred down to about 1500 feet. Since the 1970s, the surface layer of the lake has gotten warmer in the summer, and it retains that heat throughout the winter. Just like in the ocean, stratification—a warm surface layer that is distinct from the cold bottom layer—means it is hard to get the surface and deep waters to mix. Lake Tahoe is famous for its clear waters. But, as UC Davis’s recently released Tahoe: State of the Lake Report explains, the lake is not as clear as it used to be. In the 1960s, you could see down to a depth of about 100 feet, but now you can see down to only about 70 feet. The lake has become cloudier because nutrients enter the lake via 63 rivers and streams, and those nutrients fuel the growth of algae. And, global warming plays a role: the warm surface of the lake gives a particular species of microalgae a competitive advantage, and the tiny bodies of the microalgae cloud the water. The clarity of the lake, and its invasive species, will be on the agenda today at the Lake Tahoe Environmental Summit. Nevada Senator Harry Reid and California Senator Dianne Feinstein will both be at the Homewood Resort, discussing Lake Tahoe’s economic and ecological challenges. Graben doesn’t mean grave in German. Grab does, but Graben simply means ditch or gulf or gully or whatever else can be carved out, depending on the context. Tahoe does get cold under the surface, but in the summer, even at 100 feet or so, it’s still around 50 degrees. And yes, I can tell from my own diving experience that it’s not as clear as it used to be. There’s often a greenish algae bloom near the surface that robs the lake of its former clarity. As for Cousteau, I haven’t read anywhere that he was diving Tahoe. If he did, for the most part there isn’t much to see in Tahoe. Thanks for your comments, Conrad. I’ve never been diving in Lake Tahoe (too cold!) so I appreciate your perspective! Nutrients have always naturally entered the lake from its streams, albeit at a much lower level. The problem now, and cause for cloudiness is that elevated nutrients are being flushed into the lake from road construction and erosion, fertilizers from landscaped lawns and golf courses, urban pollution, and other unnatural sources. These and other sources of human caused nutrient elevation and runoff into the lake need to be addressed and minimized. Jacques Cousteau did venture to the bottom of the lake, he communicated back over the radio that he wanted the authorities awaiting his return, after the tapes were reviewed with sheriff’s officers in the trailer, he stepped out to the awaiting public and stated “The world is not ready to see the bottom of Lake Tahoe”. Later at dinner he was asked why he would not show the tapes to the public, his reply was “I have children”. Wrong. Cousteau NEVER visited Tahoe. The lake has become cloudy due to the construction of the Tahoe Keys, which rerouted the upper Truckee river around marsh land that acted as a natural filter for the primary water inlet, the result beyond cloudy water was the sand bar that stretches all the way to Ski Run Blvd that eventually lead to the end of Ski Run Marina water access. I doubt the explorer thought finding some old dead gangsters would shatter the world. I also doubt the discovery of an unknown sea creature would freak him out, I mean this is what he spent his life doing. If the story and quote is true, i would have to lean towards something a little more out there. “Graben” as a noun=ditch, “graben” as a verb=to dig, neither one means grave, as stated in the article. “Grab” is German for grave, close but doesn’t mean the same. Cousteau never visited Lake Tahoe, it was his son. And it was in a submarine, not a scuba dive. Actually, the author forgot to mention (or didn’t know a geologist) that Lake Tahoe was actually created by glaciers cutting through granite created by the uprift, as the glacier receded, the melting waters (must’ve been cave-man campfire climate change) were stopped by an enterprising young volcano at the north end called Mount Pluto which acted as a plug and formed the alpine lake. There is evidence that within the last two centuries the lake has dropped hundreds of feet below its natural rim for periods that lasted long enough to allow large conifers to grow. The remains of these conifers are still evident to date as stumps below the surface of the clear water around 150′. IN the 80’s a man named Peter Caruthers used a barge and an ROV to explore the depths of the lake and found no bodies, he did find the Tahoe Steamer at approximately 360′ to 400′ (The S.S. Tahoe was 169 feet long, thus she lies nose to stern downward) near Glenbrook, this was confirmed 2 decades later by New Millennium Dive Expeditions (NMDE). He did find “mushroom like” mounds that rose from the great depths to just a few hundred feet from the surface that supported life including the great Mackinaw that swim the waters. It was discovered in the 80’s also that runoff from the Heavenly Valley Ski Resort was causing some of the greatest damage to the lake, as each year the ski area would use nitrates in the snow making process (it was halted) but also NATURAL nitrates that occur in large snow accumulations and eventual runoff. One winter in 1983 saw 600 inches of snow around the Lake Tahoe Basin. Lots of runoff. Not man’s fault. Nitrates are like fertilizer for plant life and Tahoe will eventually become like many other lakes, green and full of abundant algae. Man cannot stop nature. Cousteau said that about Fort Peck lake in Montana if I remember correctly. Not Lake Tahoe. One of his divers was chased out of a cavern by a fish bigger than any man. I hear there are pictures and would love to see them.